I first encountered Rocky Mountain Soap Company when I lived in Calgary (the company started in Canmore, Alberta), and then again when I attended the ChickAdvisor Showcase this past summer. 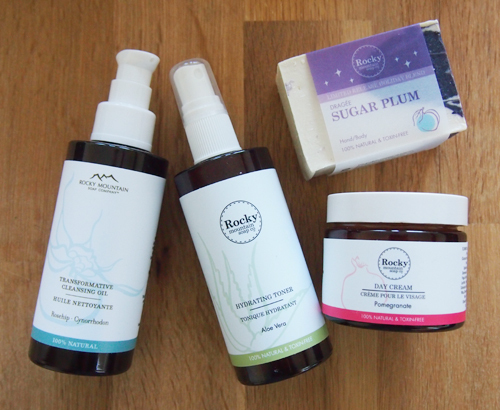 As a Canadian-owned and -operated business, Rocky Mountain specializes in 100% natural and toxin-free products, using only the finest essential oils, pure natural beeswax, food grade vegetable oils, real grains, fresh herbs, fruits, and vegetables. With this philosophy, it makes perfect sense that the company has decided to expand to Vancouver where we obviously love everything green and environmentally conscious. This month sees the opening of two new concept stores: one downtown in the Bentall Centre and the other in Burnaby at Metrotown. I was kindly sent a few products to test out and I have really been enjoying their addition to my usual skincare routine. At bedtime, I begin by applying 2 pumps of the Rosehip Transformative Cleansing Oil to a cotton pad. The oil is fairly good at wiping away makeup and dirt but if I'm wearing a lot of makeup, I do prefer to do a full wash with a cleanser first. Next, I spritz on the Aloe Vera Hydrating Toner and wipe it off with a cotton pad. I prefer natural toners like this one since many commercial toners contain alcohol which can be very drying. I usually alternate moisturizers depending on how my skin is feeling, but have been experimenting with the Pomegranate Day Cream every few days. The cream feels light but rich and absorbs quickly. The best part, however, is the scent which I can really only describe as "delicious" (ha ha, sorry that is so not descriptive). Rocky Mountain Soap Company was founded in 1995 to make natural soap by hand so trying their soap is a must as well. The Sugar Plum Soap is a limited edition holiday product which would make a great stocking stuffer. The scent is subtle but a little spicy and the bar contains gorgeous purple swirls throughout, making it a pretty addition to your sink or bathtub as well. This sounds like a really wonderful company. I'm glad they're expanding! Such a great company. The cleansing oil sounds lovely! The ingredients sound really nice! I'm really enjoying trying different brands right now especially if they are more natural. This sounds like such a great company! !